With four full-backs over the age of 30, Manchester City are facing the prospect of completely overhauling the defensive flanks in the next year or two. Pep Guardiola decided to hold off doing this in his first transfer window, instead prioritising other positions, but the left-back and right-back positions are becoming a concern and were brutally exposed by a rampant Tottenham side at weekend. Aleksandar Kolarov, Gaël Clichy, Pablo Zabaleta and Bacary Sagna could all soon find their positions under review, and while youth products Angeliño and Pablo Maffeo, both 19, are candidates to take up roles in the first-team, City are also going to have to dip into the transfer market. 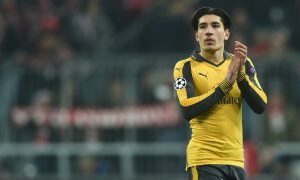 For the right-back position, Arsenal star Héctor Bellerín has frequently been linked. Just 21, the former Barcelona youth product is a known admirer of Pep Guardiola and would suit the style of football he uses very well. Unfortunately for City, buying from Arsenal is a much more difficult proposition than in the past, when the likes of Kolo Touré, Emmanuel Adebayor, Samir Nasri and Gaël Clichy swapped the Emirates for the Etihad. However, according to a report in The Times, Bellerín is tempted by interest from both Manchester City and former club Barcelona, so much so that he could reject a new contract from Arsenal that would double his salary to £50,000-a-week. The report states that a move to City is Bellerín’s preference, which would allow him to reunite with Pep Guardiola, who was in charge at Barcelona before the young defender left for Arsenal. 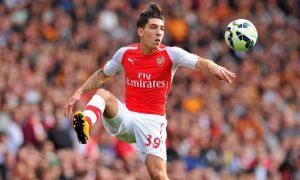 Bellerín is said to be ‘keen to work under his compatriot’. Even if Bellerín wants to move to City, it is easier said than done. Bellerín still has two-and-a-half years to run on his existing deal and Arsène Wenger insists that none of his big names will leave the club. City’s first approach didn’t end in success. @City_Watch I'm told Arsenal's response to City's approach for Bellerin consisted of two words – and the second one was off…. It would take a great deal of work from Txiki Begiristain and Bellerín’s camp to make a deal happen, but it now seems clear that there is mutual interest in making the 21-year-old a Manchester City player in future.